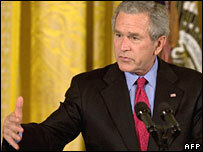 US President George W Bush has vetoed a bill that would have eased restrictions on federally funded stem-cell research. He also issued an executive order encouraging scientists to focus on ways to conduct research without using stem cells from human embryos. Mr Bush said advances must be pursued in a way "that respects human dignity and upholds our moral values". The Democratic-led Congress is expected to try to override the veto but is unlikely to get enough votes. The veto is only the third issued by Mr Bush during his administration, following a veto of a similar draft stem cell bill in 2006 and a bill on Iraq funding. The Democrats argue that restrictions on stem-cell research are impeding vital medical progress and vowed, upon taking charge of Congress last year, to ease curbs on federal funding. Critics say the research requires the destruction of human embryos and argue that alternative methods are showing promise. The BBC's Jonathan Beale in Washington says the battle lines are clearly drawn between those who see stem-cell research as a threat to the sanctity of human life and those who believe it is the best way to offer new hope to millions of patients. Mr Bush has repeatedly refused to use taxpayers' money to fund expanded embryonic stem-cell research. Speaking at the White House, Mr Bush said innovations in science were fuelling advances in medicine other than stem-cell research. "If this legislation became law, it would compel American taxpayers for the first time in our history to support the deliberate destruction of human embryos," Mr Bush said. "I will not allow our nation to cross this moral line." "Our conscience calls us to pursue the possibilities of science in a manner that respects human dignity and upholds our moral values." White House spokesman Tony Snow earlier denied suggestions that the veto was "an attempt to muzzle science". But the Democratic Speaker of the House, Nancy Pelosi, said Mr Bush "ignored the will of the American people, of leading medical researchers, and of a bipartisan majority of the Congress". Speaking at a liberal conference earlier on Wednesday, Democratic Senator for New York Hillary Clinton said the decision "puts ideology before science, politics before the needs of our families". Stem cells are immature cells, created shortly after conception, which have the capacity to turn into any kind of tissue in the body. Scientists hope to use stem cells taken from frozen human embryos to repair tissue affected by disease or injury. They say the research could provide breakthroughs in the treatment of debilitating diseases like Alzheimer's and Parkinson's. The process of extracting stem cells from an embryo destroys that entity; conservative Republicans have likened the destruction of frozen human embryos to abortion. Surveys suggest a majority of Americans support expanded stem-cell research. Mr Bush imposed restrictions on spending government money on stem-cell research when he came to power in 2001. He limited the offer of federal funds to research on stem-cell batches that were already available that August and ruled out funding work on fresh batches. The president favours an alternative form of research which uses cells taken from amniotic fluid, placentas and from embryos that have died naturally.